This will be my last entry before I head to the wilds of Northern Ontario for the summer to teach kosher cooking to campers of all ages. It is a very exciting opportunity because I am very motivated to teach young people to cook. In my experience, many young people don’t how to cook, and even worse, don’t feel confident or comfortable in the kitchen. I can’t wait to get in there, roll up my sleeves and get to work. I know many of you heartily agree about the importance of home cooking and how it helps strengthen families in so many ways, but dare I say that we’ve gone off the rails a tad when it comes to transmitting these culinary skills? Cooks aren’t born cooking you know. We become educated by knowledge, experience and the greatest teacher; trial and error. I know, at times, I forget this. I want instant, picture-perfect results. I believe, at times, mistaken notions have resulted from over-reliance on recipes, especially the exciting ones with colour pictures that promise oh-so-easy instructions, that can leave some of us in tears of frustation with scorched dreams. (There is a recipe for kettle popcorn in a new kosher cookbook that resulted in disaster for a dear, young ‘cook of my heart’.) It’s only after becoming a seasoned cook that you can have a sporting chance of navigating the shoals and rocks of recipe integrity. Good recipes provide a map, but can only promise success once we’ve learned to master basic cooking skills. 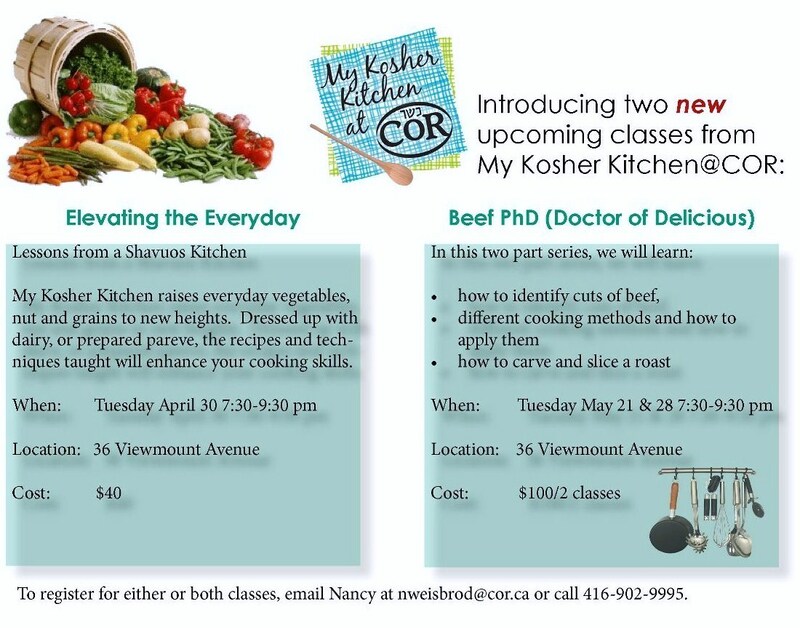 In planning next year’s calendar for My Kosher Kitchen @ COR, I realized that in addition to the core courses, I would like to try and organize something new, something that really builds our culinary knowledge. And realizing there is definite strength in numbers, I think that if we unify as a group, we should benefit. In our time together, let’s not only learn new culinary techniques, but really reap rewards. Tuesday August 27th, in the morning, I am arranging to purchase a whole tuna from King of Fish, (Chabad Gate Plaza). We will have the incredible experience of seeing this majestic fish whole, and benefit from the freshest purchase to wrap it up and have in our freezer for our super-early, three day yomtovs. I have been given a price of approximately $15/pound (compared with the usual price of around $23/pound) because we will be taking the whole fish. Since the fish, after its cleaned and trimmed is still between 100-120 pounds, we need 10 people to commit to taking 10 pounds each. There will be a $36 registration fee and we will also learn a few recipes to feature this delicious, lean delicacy. So if one of your goals for the new year is not to gain 5 pounds after each Yomtov, and you are interested in participating in this unique opportunity, please reserve your spot with me asap. Where: The King of Fish, 7241 Bathurst St. Cost: $36 + 10 pounds of tuna x $15=$150 (approximately). Your tuna will be cut to portion and wrapped for the freezer. Wishing you a safe, healthy and fun summer. Last night we finished the second of the two part series, Beef PhD. I personally found researching this class fascinating. Armed with several roasts and a variety of beef cuts from Toronto’s finest butchers, I sat down with my brother Paul who has been a ‘meat man’ his whole life. Growing up in the meat business, you would think that alot of this would already make sense to me, but I can tell you that ever since I became kosher, over 25 years ago, meat has been more of a mystery than ever. We began by looking at the anatomy of a cow, identifying what’s kosher, and then proceeded to identify where those cuts come from on the animal. This helped me understand which cooking procedures benefit which cuts, and even more, how to get better value. Let me say that there is a big variety in price, quality and butchering between the retailers and if anyone would like to take this conversation offline I would be happy to share my findings. I would like to thank the dedicated students who have supported my teaching in the Beef PhD class, and indeed, the whole year’s curriculum. 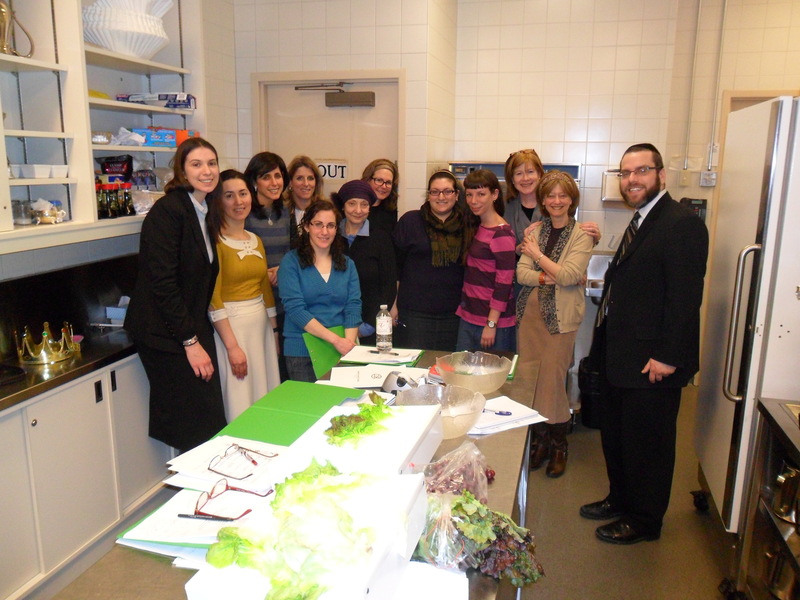 You each have made an impact on My Kosher Kitchen @ COR and it has been a delightful experience. I look forward to begin planning classes for the upcoming year, and if you have any suggestions, please send them along. Next week will be my last blog before I head up to Camp, in Northern Ontario, to teach cooking to several hundred campers. I am really looking forward to this challenge and appreciate the opportunity to teach cooking skills to a variety of ages. I am including a recipe (note the addition of kiwi puree used for its tenderizing characteristic) for a beef marinade in which a Beef Blade London Broil was marinated. After which, I cut some thin slices, threaded them on skewers and grilled them. Browning the remaining meat, finishing it off in the oven, and slicing it created a beautiful dish especially served with an Oriental cabbage salad. 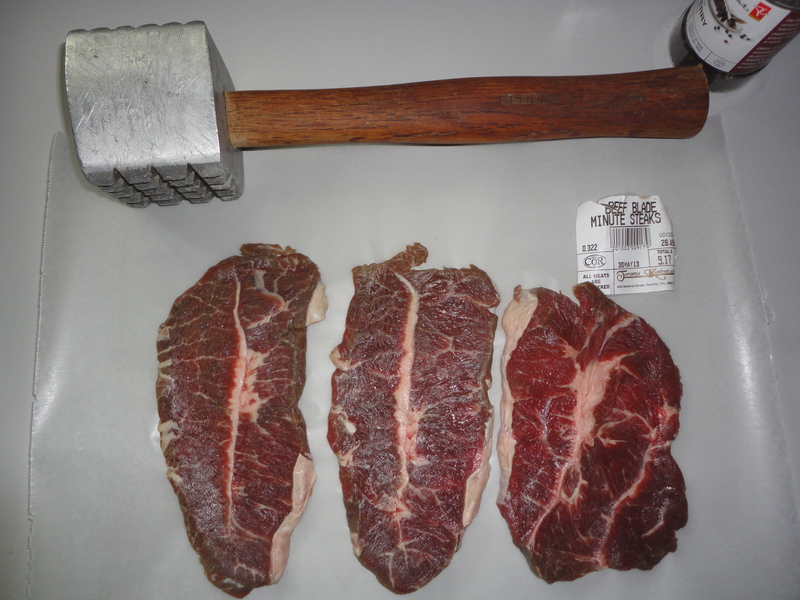 Also note, the picture above demonstrates another tenderizing technique of hitting the meat with a pounder. 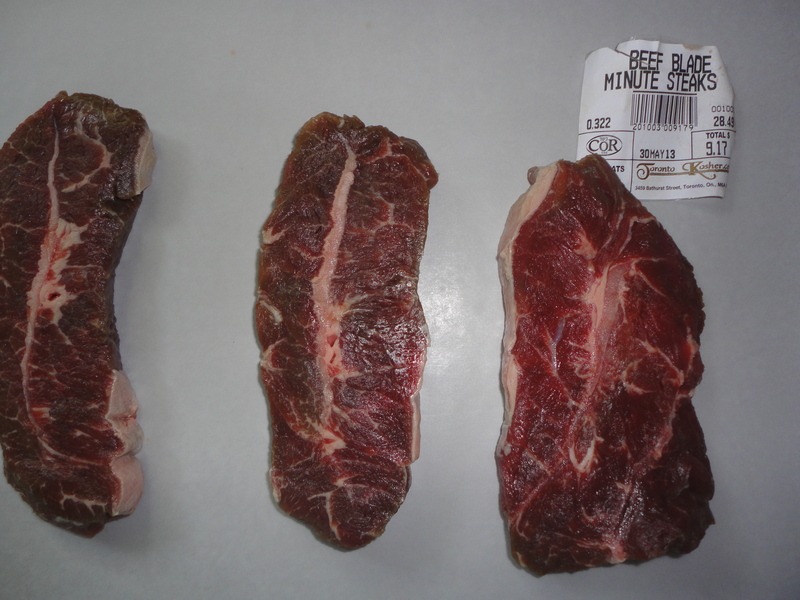 This method also breaks down the tough connective tissue that can make meat chewy. Add the soy sauce, orange juice, honey, kiwifruit, sesame oil, ginger, garlic and scallions to a Ziploc bag. Seal the bag and mix until all the ingredients are combined. Add the beef to the bag and marinate for at least one day. We discussed cuts from the shoulder and chuck and how to braise them to obtain maximum flavour and tenderness. Next week we will tackle brisket, which cuts to use for successful grilling, and the king of roasts, the prime rib. Speaking about flavour infusion, the other ingredients should also serve to enhance, rather than mask. It is sensible to include the aromatic vegetables; onion, garlic, carrots and celery in your marinade, as well as any fresh herbs that go with beef, such as parsley, bay and thyme. There should always be a little oil in the marinade because fat carries flavour and how else can we get the flavours talking to each other? If you are thinking ahead, plan on marinating your beef anywhere from four to six hours, on the counter, turning the meat every so often. Or, you can refrigerate overnight, making sure you lift the meat out of the liquid and dry it very well with paper towelling before cooking. Remember, damp meat doesn’t brown. It’s the initial browning, whether in your heavy skillet, or on the grill, that sears in the flavour and tenderness. Reduce the marinade by straining it and simmering in a saucepan to make a lovely sauce to serve with your beef and you’ll be well on your way to obtaining your Doctor of Delicious, a Beef PhD. Place half of the vegetables and herbs in the bottom of the marinating dish. Dry the meat well with paper towelling and rub with the salt and pepper. Place the meat on the vegetables. Spread the rest of the vegetables and herbs over the meat and pour on the wine and olive oil. Let the meat marinate from 1 to 6 hours on the counter or overnight in the refrigerator. Turn and baste the meat occasionally. 30 minutes before cooking, lift the meat out of the marinade and dry with paper towelling. The meat will not brown if damp. Heat another 2 – 3 Tablespoons of oil in a heavy casserole with a tight fitting lid. Brown the meat well on all sides. This can take up to 15 minutes. Set the meat aside on a plate. Pour the marinade into the casserole and boil it down until partially reduced (this boils off the alcohol). Add 2 – 3 cups of beef stock or water to come half way up the meat. Cover tightly and set in a preheated 325 oven. Let the roast braise for 2 – 2 ½ hours. Turn the meat occasionally while braising. When the meat is tender, lift it out of the liquid. Strain the liquid through a sieve into a saucepan and press the liquid out of the vegetables. Simmer until the liquid is reduced and syrupy. There should be approximately 2 cups finished liquid. Taste and correct the seasoning. Slice the meat against the grain into thin slices, arrange on a platter and spoon the gravy over all. I was cleaning up from last night’s class, Lessons from a Shavuos Kitchen, Elevating the Everyday, and realized I forgot to take pictures. We had a great time and made some delicious dishes. Everyone had a chance to practice their knife skills by slicing mushrooms and their coordination by flipping crepes. 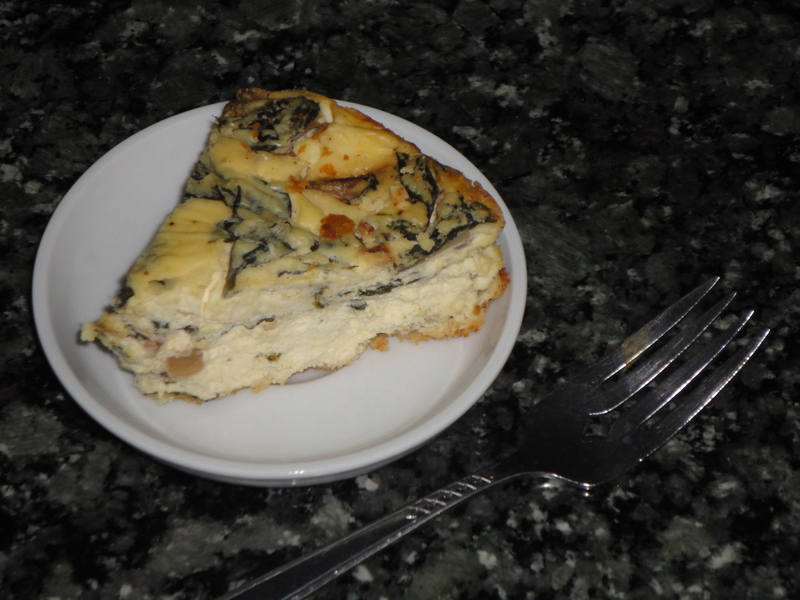 One of the recipes taught was a Savoury Cheesecake, an idea I encountered decades ago in England. Using either cream cheese or pressed cottage cheese, these creations became the base for flavours such as chili-cheddar, Roquefort avocado, and my personal favourite, spinach mushroom, otherwise known as the Florentine. When I finally got the camera out, all that was left was this one last, lonely piece, but you can be sure I’ll be making more for Shavuos. In a bowl, combine the crumbs, butter and parmesan and press into an 8” springform pan. Bake for 10 minutes. Turn the oven down to 300. In a pan, sauté the onion in the 2 Tablespoons of butter, add the mushrooms and cook until the mushrooms give up their liquid and are dry and lightly browned. Add the spinach and continue cooking for a few minutes or until the spinach is wilted. Mix the cheeses, eggs, cream and seasonings until smooth. Fold in the mushroom onion mixture. Pour onto the prepared crust and bake for 1 ½ hours in the 300 oven. Last night I attended a fundraising event for the Toronto Teachers’ Center of Torah Umesorah, ‘Taste for Success’, the ‘Kosher Chef Challenge’. The Teachers’ Center provides all teachers in the Jewish Day Schools with resources, equipment and professional development. It was an excellent evening with lots of fun, surprises and culinary instruction. A raffle was held and the winner got to join the judges on the dais and sample the chefs’ creations. Imagine my surprise when out of this packed hall of women, my name was announced! It was a sincere honour and thrill to be on a stage and join celebrated individuals who have devoted their careers to culinary excellence. While I was sitting up there in front of everyone, (and hoping that I didn’t spill anything on myself while tasting) I got to thinking. I wondered what united these chefs and judges, who possess a very high level of knowledge and expertise, with the hundreds of devoted home cooks in the audience? I heard the answer from one of the competing chefs, Ayelet Or. When questioned by the culinary moderator, Executive Chef of the Park Hyatt, Joan Monfaredi, what Ayelet was using in her dish, she replied; “Love”. I thought a truer word was never spoken. Every last person in that vast, packed room shared the desire to educate ourselves in the pursuit of feeding those we love. Every food professional, from which we hope to be inspired, all learned to cook from someone. I bet if you sat down over a glass of wine with each one of them, they would admit that their desire to cook came from home. I don’t think the quality of the dining experience is provided by the excitement of the ingredients, or the latest piece of equipment, but rather with what dedication and commitment the cook infused the food. This week’s recipe is for Squash Galette. A galette is a roughly formed tart. No need for a tart pan or pie plate. Simply follow the directions and prepare on baking sheet. PS Please join us for two new exciting classes. See the above poster for details. Add ½ the flour and salt together in a mixer. Cut the shortening in and blend for a minute or two. 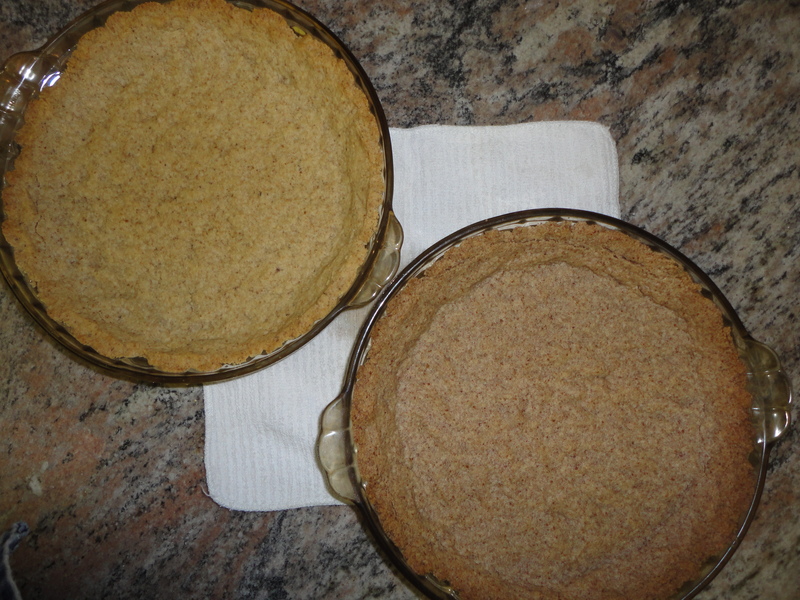 Add the rest of the flour and mix until the it resembles a crumbly mixture. Sprinkle on the water and mix until the dough comes together. Let the dough rest for 1 hour in the fridge. Place squash chunks on a parchment lined baking sheet and roast in the oven for about 45 minutes or until softened. Sauté onions in a skillet and season with salt and pepper and then set aside until cool. Roll out the pastry into a rough circle, approximately ¼” thick. Mound the squash filling in the centre leaving a border of 2-3” all around. Scatter the onions over and sprinkle with the walnuts, if using. Gather up the dough around the filling leaving the centre open. Bake the galette in a 375 oven for 45 minutes or until lightly browned. Serve warm or at room temperature. During this period on the Jewish calendar, we are counting the days between Pesach and Shavuos, the holiday when we celebrate receiving the Torah. Although I don’t regularly think about carrying over the dishes I make at Pesach into the year, my thoughts are shifting. That’s because, I have to admit, I really do love the food I make on Pesach. Why then do I habitually brace myself right around Purim as if preparing for something unpleasant? I accept that Pesach is hard work, and I’ve learned to free myself from other commitments in the lead-up, but why do I have such a hard time thinking about my Passover kitchen as a year round resource and refuse to capitalize on its benefits? When I plan my Passover cooking, I usually begin thinking about what I can’t use-chometz. I’ve noticed that this is not such a positive approach. If I was going to make a meal and my family asked me; “What’s for dinner?” I definitely would not respond; “Well, we’re having such and such, but that’s only because I couldn’t make so and so.” I’m sure you would agree that it’s not the best sales tool, for either the cook or the consumer. So this year, I’m trying to make a conscious effort to focus on what is special at Pesach. If you refer to the COR Pesach guide, http://www.cor.ca/view/434/cor_passover_guide_20135773.html, you will see some of my favourites, but there are a few other dishes that are really excellent and I had to taste them to remember how good they are. Not to mention that I received an ice cream maker from my kids for a pre Pesach birthday gift (talk about the gift that keeps on giving), and we really enjoyed that. 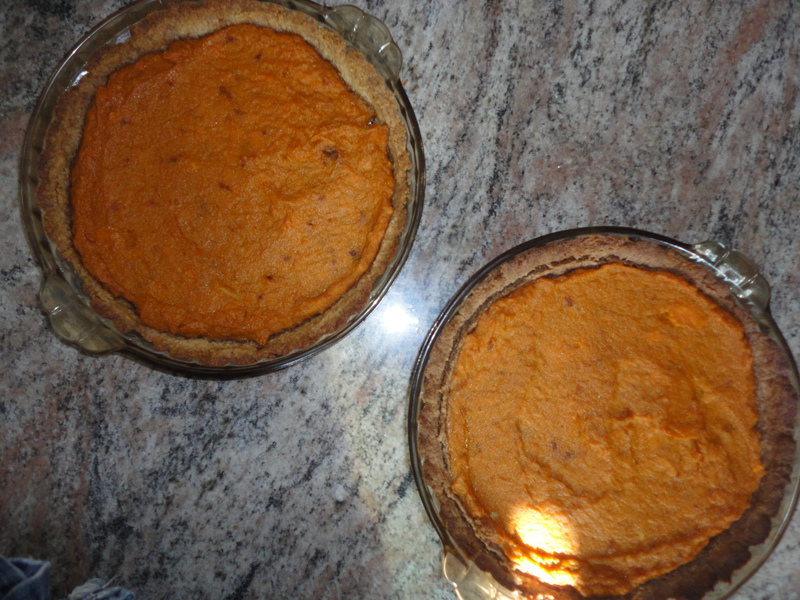 In reviewing my Pesach meals, (so that I’m not starting from square one next year), there is something I make that has no history, symbolism, or particular eye appeal, but is downright delicious and that is a Sweet Potato Tart. I would like to call it a Sweet Potato Pie, because the name rolls off the tongue in such a sweet Southern way, but then you might risk serving this only for dessert. Although the flavour is a little on the sweet side, and can fall into the ‘afters’ category, it definitely is a savoury dish and belongs during the meal, especially if it’s served with a mess of caramelized onions on the side. In trying to bring Pesach into the year, and making each day (meal?) count, I’ve decided that the focus of my next few blogs will be on savoury tarts, of which the Sweet Potato is an example. They are so lovely and light and equally delicious either pareve or dairy, especially if you like to serve cheesy-milky meals during the holiday of Shavuos. They can also be prepared in advance and served hot for Friday night or room temperature for Shabbos lunch. Although, this tart looks rustic, it’s taste will convince you to include it in your recipe repertoire (and there is no oil or margarine in the filling, only the creaminess of the sweet potato). The Pesach dishes are now put away and when the holiday ended, it all seemed to happen so fast, I almost wonder if I dreampt the whole thing? Weeks and weeks of preparing went by in a blur. The seders were over in a blink and the remaining days were a timeless mix of the wonderful roller coaster of family being together and friends dropping by, with just the right amount of delicious foods, singing and stories holding it all together. I am always astounded by the delicate balance between how much food I prepare (lots) and what’s left at the end (none). Nobody went hungry, I assure you, but the cupboard was officially bare. One of the primary kitchen values I was taught, especially at Pesach, is that nothing is thrown out. “Everything I have I need and everything I need I have.” Even cardboard and plastic containers are reused to store little delectable treasures. I think it is the simplicity of this approach that makes such an impact. The family has long since discovered that the matza farfel cardboard drums become cookie jars and those unassuming boxes that held the shmura matzas have been rededicated in the service of delicious. Everyone learns not to take anything for granted and to experience the rewards of investigation. One of the simplest and most enjoyed treats of Pesach were the chocolate ‘Chariot Wheels’ (aka chocolate bark) that have become our simcha signature. I took a 10.5 ounce bar of Shmerling’s Menage bittersweet chocolate and melted it very slowly. The bar was broken into chunks and put in a heatproof bowl over a pot of simmering water and left, undisturbed, for 20 minutes or so. Once melted, I poured it into a round aluminum foil pan (no greasing or paper liner, nothing) over which coarsely chopped, toasted almonds and craisins were scattered. I let it sit on the counter to firm and then put it in the fridge for an hour to move its hardening along, but once solid, popped it out of the container and put it in a napkin lined box for storage. This was a simple way to celebrate joy and its always nice to share a little something sweet from our kitchens to mark a happy occasion. Especially on Pesach. It’s not like we can run out to the store for anything fancy and this is where the resourcefulness of the Pesach mindset benefits. I hope it lasts. To My Kosher Kitchen’s dear readership: Thank you for your comments on the What’s Cooking article from My Kosher Kitchen that appeared in this years COR Passover Guide. There were many creative suggestions and good questions generated. One in particular was Heather’s idea to save the orange syrup from her own Pesach Candied Orange Peels and use it in her hot drinks (like the Sweetened Tea Essence) or as a syrup for Sponge Cake. Great idea, Heather! Please continue to send in your helpful tips and suggestions so that we all may learn. Well, as my dear mother used to say, ‘the best laid plans of mice and men aft gang aglay’. (No, that isn’t Yiddish. I think it may be Welsh which is unusual because my Mom was Canadian born of Polish parents. But she was well read and I recall many of her sayings and quotes and find them coming out of my mouth even before I am aware of it.) I had hoped to get this recipe out to you last week, but found myself unable. Just as well, you’ve probably got more than enough on your plate and need another recipe like you need a ‘loch in kopf’ (that is Yiddish for a hole in the head). Although you may not have enough time to work this special dessert into your pre Pesach cooking plans-which I’m sure are pretty much underway, try and practice this delicious gateaux a few times through the upcoming year. When next Pesach roles around, you will be able to make it with confidence. PS Although this recipe is adapted from one by Kitty Morse and Danielle Mamane, my own Mother used to make one very similar. Preheat oven to 300. Grease 3 x 8” molds. Cut 3 rounds of parchment paper to line the bottom of each. To prepare the meringue, in a large bowl beat the egg whites with the salt. Slowly add the sugar and continue beating until stiff peaks form. Divide the egg whites among the three molds and smooth the tops with a spatula. Place in the oven and decrease the heat to 275. Bake until the meringues are dry, about 1 hour, and let them dry further in the turned-off oven overnight. Blend the hazelnuts and 1 Tablespoon of the remaining sugar. Melt the chocolate, coffee and remaining 2 Tablespoons sugar in a heatproof bowl over a pot of simmering water. Let it cool slightly. Whip the cream. 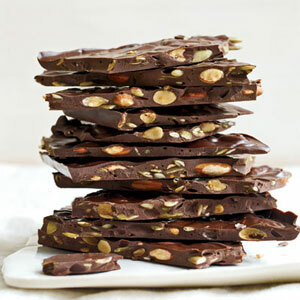 Gently fold in the melted chocolate and half of the ground nuts. To assemble the cake, peel the paper from the bottom of the meringue. Set one round on a serving platter. With a spatula, spread 1/3 of the ganache over the top. Cover with a second round and repeat. Top with the third round and spread with the remaining ganache, spreading it over and around the sides of the cake. Pat the remaining nuts around the side of the cake and refrigerate. As home cooks, one of the things we want to do for our family is to offer a variety of tastes. Restaurants and take out, no matter how much of a welcome break we think they may provide, cannot meet this goal. Store bought food has to be standardized. This is the only way that a business can be successful. It can’t experiment or respond to each customer’s unique preference. This lesson really hits home during the holiday of Pesach when these establishments are usually closed. Aside from the obvious advantages that making food from home offers, to me, the greatest one is the ability to develop an appreciation for different tastes. It is interesting that the same word, pallet, refers to our array of tastebuds, and also, on what an artist arranges and mixes paint colours. It is at the times of our holidays, our celebrations, that we can really let loose and take our cooking to new heights. Sometimes we relish in the comfort of familiarity, and we don’t want to ‘fix what ain’t broke’, but in adding a new flavour note, we can liven up a well loved tune. This Pesach, consider adding a surprising element of heat to your repertoire. 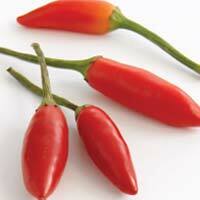 The sweet-hot flavour that fresh chillis deliver can enhance side dishes and even the humble shnitzel. I really enjoyed making this unique spread over the last few weeks and trying it in different ways. Keeping it as a thick paste, it can be tossed with simple steamed vegetables, such as carrots, zucchini or cauliflower. Thin it down with a little more oil and hot water and toss it with roasted root vegetables, bake for an extra 30 minutes and you’ve got delicious chilli-nut coated morsels. Thin it down a little more and dredge your schnitzel (turkey, chicken or veal) in it before coating with crumbs and baking. Heat the 1 Tablespoon of olive oil and saute the shallots or onions for a few minutes. Place the almonds, garlic, chillis and sauteed shallots/onions in the food processor and pulse until the mixture is smooth adding the oil, honey and seasonings until it reaches a pastelike consistency. This chilli paste can be stored in the refrigerator for several days. Use it to add a little sweet spiciness to your Pesach menues. Next week I look forward to sharing my favourite Pesach dessert, a meringue layered with chocolate and hazelnut ganache-not at all difficult. PS Here is a picture of the first graduating class of Mashgiach@Home taught by Rabbi Tsvi Heber, our 3 part series, teaching everything you need to know about expertly managing your kosher kitchen. Now that the house is finally cleaned up from all the Purim festivities, we know what’s coming next. But Purim was fun and I don’t want to say goodbye so fast. It was unexpected, surprising and, as one visitor stated, more low key than in previous years. I am getting big on low key. When things are low key, there is room to improvise. Who knows, (“U-me yodea?” as it says in Megillas Esther), what might happen? But let’s go back to the “U-me yodea?” Mordechai asks. These simple words are posed to Esther when she is reticent to act on the opportunity that ultimately leads to her greatness. But, hold on, this question sounds familiar. Isn’t “Ehad me yodea?” (“Who knows one?”) one of our most beloved Seder songs? We have sung this song at very high speed, complete with hand actions, each year, evidently soused from four cups of wine. If we stick with this line of reasoning a little longer, both Purim and Pesach are pointing to the same idea, but in a remarkable way. These holidays are all about the question. As the saying goes, a good question shmekts (is tasty). Does the converse hold true? Does a good taste make a question? Do people want to know what makes something taste good? Maybe inspiring curiousity is the inspiring hinge? And, if the question is the thing, how do we spark one? We all know rewards and praise are motivating, but how about the spark of a real question? How do we ignite that? 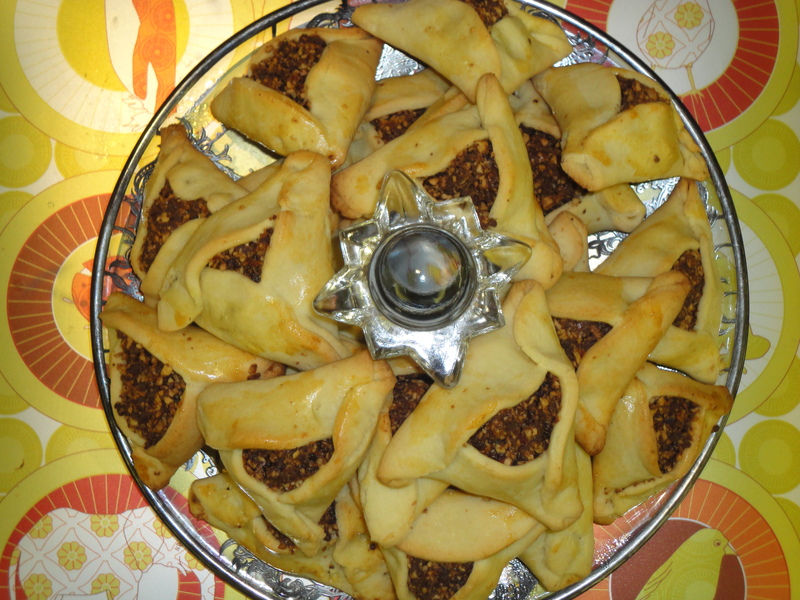 At this point, I have to say that this year I made a new hamentashen. I was experimenting with a twist on my classic green beans, based on a recipe by Mark Bittman, which called for a dressing of almonds, chilli, garlic and oil. It was thoroughly delicious. Emboldened by working with chilli, and ready to make hamentashen, I thought why not add some to the chocolate hazelnut filling? Cautiously, a small batch was made. Realizing that we had sampled a more-than-needed-to-test portion of the filling, we put down our spoons and declared a victory! Here is the recipe for the hamentashen filling, which I urge you to make note of for next year. Mix all ingredients except the syrup in a food processor and pulse until the ingredients form a paste. Add enough syrup to bind the chopped mixture together.